Added on January 4, 2018 by Eric Bernasek. Kansas hosted the very first Riley County Fair in 1869, an annual event that continues almost 150 years later. In the early ’80s, my older sister and I were making semi-annual summer pilgrimages from home in the central-Jersey suburbs to Manhattan, Kansas (the “Little Apple”), where our parents grew up. The Riley County Fairgrounds are still a few minutes walk downhill from the house where our dad’s parents then lived, and where we spent a good stretch of the summer in 1983 (and ’84 and ’87 and ’89 and…). Amid the long stretches of childhood boredom in the pre-internet era, the late-summer arrival of the Riley County Fair was like a Technicolor oasis descending on the sparse, duo-chromatic landscape of the Flint Hills. That year at an Ottaway Amusements booth, my sister won a shiny, little 45, a vinyl record in a white paper sleeve. The sticker, then standard for MCA records like it, was sky blue, with puffy airbrushed clouds and a rainbow arching up from one wispy white platform in the upper-left corner. The music? 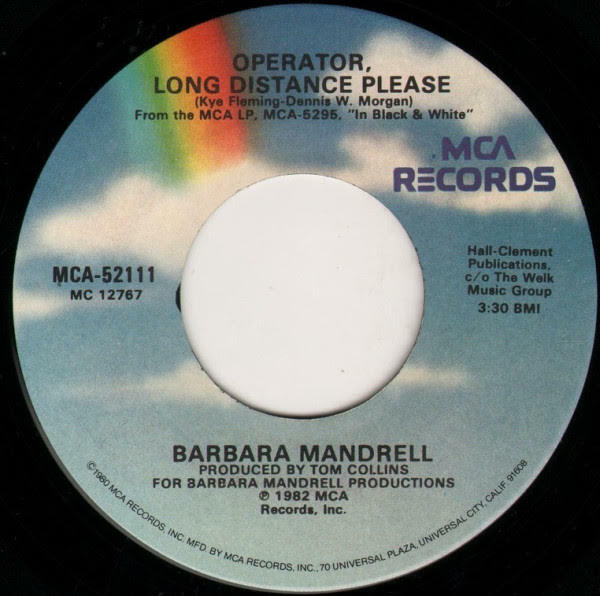 “Operator, Long Distance Please,” the second single from Barbara Mandrell’s 1982 album, In Black and White. Years later, during my obligatory tenure as a record store clerk, I picked up a dollar copy of the full album from an actual bargain bin, but “Operator” is the only song from the LP that’s stuck with me. In 1982, Mandrell was unknown to us. We were East Coast kids—despite our semi-annual re-education program—so we were immersed in Michael Jackson, Madonna, Duran Duran and Billy Joel. Not that it should have made much difference. In the early ‘80s, Mandrell was musically more adjacent to Lionel Richie or Tina Turner than she was to George Strait or the Judds. She’d been a country music prodigy who spent her teen years on tour with the Johnny Cash Show, where she played steel guitar for Patsy Cline, alongside Cash, June Carter and George Jones. She’d started a moderately successful solo career after that, and she would go on to be repeatedly awarded by the Country Music Association and become a member of the Grand Ole Opry, but in the ’70s she’d switched labels and started working with producer Tom Collins. He helped her record the first of her singles to crack the top five, “Standing Room Only,” a country ballad through and through. A few years later Collins enlisted the help of songwriting duo and frequent collaborators Kye Fleming and Dennis Morgan, who wrote Mandrell’s first number one hit, “Sleeping Single in a Double Bed.” With strings, backup singers, more piano, less guitar and an arguably funky rhythm section, “Sleeping Single” sounds more like adult contemporary than country-western. Collins, Fleming and Morgan were also behind the two singles from Mandrell’s In Black and White. The first, “Till You’re Gone,” has echoes of the pop quasi-groove of “Sleeping Single” but adds saxophone and an amusingly dated synth. It too was a number one hit on Billboard’s Country Singles, only one of four for Collins in 1982. Three of those four were penned by Fleming/Morgan. All of them pushed the furthest boundaries of what has come to be known as “countrypolitan,” a style in which big studio pop sounds overwhelm the sonic signatures of country music. The second single from In Black and White was the one my sister brought home from the Riley County Fair. The A-side, “Operator, Long Distance Please,” captured our full attention. For the rest of that summer we played it repeatedly, almost incessantly, while the B-side, the eponymous “Black and White,” got no love. It’s easy to understand why: “Black and White” is a schmaltzy easy-listening duet. Mandrell is joined by Gene Miller, a backup singer from her live act and a regular part of her TV variety show, “Barbara Mandrell and the Mandrell Sisters.” And it’s a melodramatic song about divorce—“Is this the way love ends/ with paper and a pen?”—which was too heavy for us kids. “Operator,” meanwhile, is epic, infectious pop. The only thing identifiably country is Mandrell’s voice, which has a subtle but discernably Nashville twang. The rest of the track features an impressive studio-engineered soundscape that projects the idea of spaciousness while actually being densely layered with several smaller interdependent parts, including an exhilarating string section. We played it on an endless loop, partly because it was something to do and partly because that’s what it was designed for. The song is about a woman whose husband or boyfriend is away from home—“I woke up alone/ The bed was so cold/ I learned a lot in just one night/ I don’t like TV/ I don’t like to read/ And I don’t like this single life”—and she’s trying to get him on the phone in the hope he’ll come back home. Rhythmically, the song is energetic, even upbeat, but melodically and harmonically it employs a tension that helps to depict the anxiousness of its subject. In particular, the chorus uses a steadily rising sequence to build up to the temporary relief of its lyrical payoff. As the title suggests, the anxious subject has enlisted the now anachronistic help of an operator to connect her with the beloved she just can’t seem to get on the other end of a phone. It’s not for lack of trying: “I’ve been calling all afternoon/ There’s something wrong/ I can’t get through.” She’s also tried “Yellow Cab,” “the airlines” and “the hotel where he stays/ When he goes to L.A.” (an admittedly atypical destination for a country song). But she’s convinced that if she can just get him on the phone, everything else will take care of itself: “Operator, long distance please/ I can’t wait for him to call me/ I only need a second or two/ That’s all it takes to say ‘I love you’.” That last line, in a moment of arrival after the musical round-and-round of the chorus, is the temporary relief of a melodic line that falls back down to rest after a buildup of musical and lyrical anxiety.